We were reading up on some blogs and came across this challenge via Kelly at Cobwebs, Cupcakes & Crayons. So we headed over to join Trish at Love, Laughter and a Touch of Insanity in her Pin It and Do It October 2012 Pinterest Challenge. It’s quite simple. So join the fun! To participate choose your level (Timid Pinner: 1-3 Pins, Pinterested: 4-7 Pins, Pin Obsessed: 8+ Pins) and then make (or do) that amount of pins during the month of October. 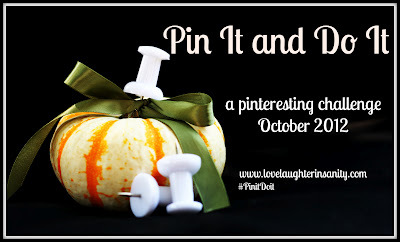 As you complete your pins you can report back by linking up to her blog at Love, Laughter, and a Touch of Insanity. The challenge ends October 31st. We’re trying for Pinterested! Follow us on Pinterst to see our progress. Thanks so much for joining the challenge! I really look forward to seeing what everyone decides to do for this month–hopefully some really awesome fall inspired things.